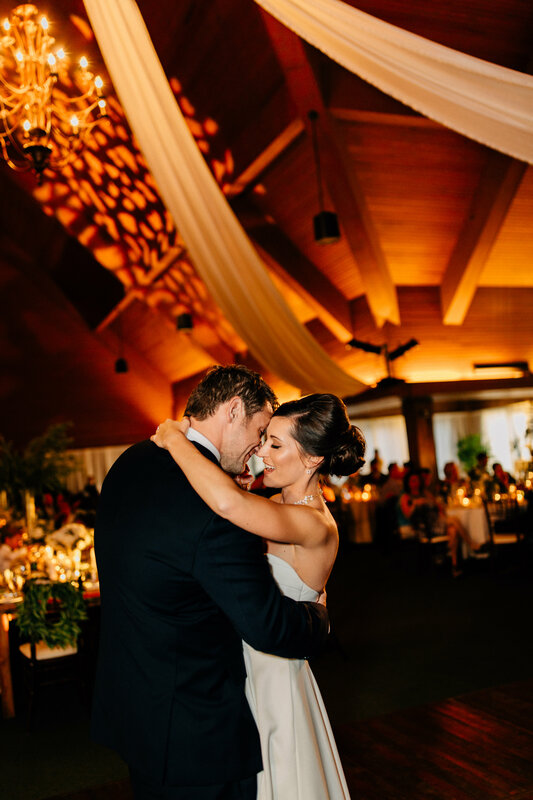 After touring several different venues, we kept coming back to how much we loved the look and feel of Keeneland. It doesn’t get much prettier than the landscape of Keeneland and beautiful architecture of the Keene Barn. Plus, the staff was great to work with! From the local beers to the Kentucky hot brown hors d’oeuvres, every detail welcomed guests with southern charm. Their hors d’oeuvres also consisted of seared crab cakes, togarashi Hamachi, and market vegetable spring rolls. After the cocktail hour, the plated dinner offered guests a baby green gem salad, seared filet of beef, pan roasted chicken, and pan roasted yellow cauliflower. "David proposed on Halloween night! We spent the evening trick or treating with family and headed back to my sister’s house to relax for the rest of the night. Little did I know, David had the ring in his pocket, had asked permission from my dad, and spoke to my brother in law about incorporating my nephew into the proposal. I was sitting on the couch when my nephew brought me a gift bag. I thought he was bringing me some candy but when I pulled the tissue paper out, I saw a ring box instead. David kneeled down in front of me and proposed right there in front of my family – completely shocking me, my momma, and my big sister! David knows how much family means to me and knew how special it would be to me to have my family there. He was right! It meant the world to me!" How did you choose your floral design? "I wanted a lot of greenery with white flowers. Additionally, I wanted it to look natural while also elegant. When I met with Jeremy at House, I told him I’d love to line the aisles with greenery as well as frame the altar with greenery. He found the most perfect plant to make the beautiful garland pieces. The floral design was one of my favorite parts because they made such an impact at the reception. House did an AMAZING job making my vision come to life! When I see pictures of the reception, my eyes are drawn to all of the amazing floral details – the wreaths on David and I’s chairs, the mix of textures, the different heights of the arrangements, the greenery at every plate – it was all amazing! Additionally, we rented large ferns to place throughout the venue, which greatly added to the floral design." "After talking to our photographer and looking at our timeline, we decided we would do a first look in order to maximize our time for pictures. It ended up being a wonderful experience and we loved having that time with just us to relax and take it all in. Our first look was on a beautiful tree-lined street/lane in Keeneland and it was a gorgeous setting for this precious, special moment." "Between our families, we have 5 nieces and nephews (2 nieces and 3 nephews) that are very special to us. This includes two sets of boy/girl twins plus our oldest nephew. They were all in our wedding as our flower girls and ring bearers and they were precious. I had a vision of what I wanted the flower girls to wear and searched high and low to find it. All of the kiddos were absolutely adorable and did a great job! It was really special to have all of them in our wedding party as well as my sister, his sister, and both of our brother-in-laws. I also really, really, really loved our head table – we rented long wooden tables for us and our bridal party and it turned out beautifully – better than I imagined!" How did you choose your wedding cake? Did you get to have any fun tastings? "I’ve loved funfetti for as long as I can remember and have always said I would have a funfetti wedding cake when the day came. After some reassurance from my family and David that it wasn’t silly to have a funfetti wedding cake, we went for it! Our guests were able to choose from three choices for their cake – funfetti, chocolate, and chocolate chip. We loved our vendor (Lennie Underwood) and she did a great job with both the flavor and look of our wedding cake. I wanted it to be simple with greenery included and she nailed it!" What’s next for you as a couple? What memories are you looking forward to making together? "We just celebrated our one-year anniversary and can’t believe how fast our first year of marriage went. We look forward to making many more memories together with our friends and family and love that every time we visit Keeneland, we are visiting a place that means so much to us. It’s really special that we can visit our wedding/reception venue any time and relive the best day of our lives!"